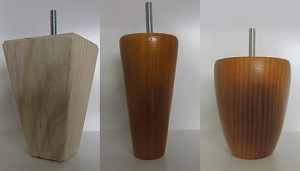 One of the best ways to revive your upholstery when repaired or restored is with furniture legs. Plus it doesn’t matter if you are looking for modern simplicity or antique finesse, matching furniture legs will complete and balance a piece. There are a wide variety of furniture legs at Peter Ross Enterprises. You can choose from different shapes, sizes, designs and materials like metal or wood. And to fit your decorating style, choose the ideal matching furniture legs to refresh and upgrade your upholstery. Metal feet for upholstery at Peter Ross Enterprises are designed by countless inspired ideas. One thing for sure, functionality and appearance are always kept in mind. Peter Ross Enterprises offers diverse and exquisitely crafted products including both contemporary and modern styles. In fact, there are endless possibilities to style and matching your upholstery. As well, Peter Ross Enterprises carries a large variety of metal furniture legs. For example, extremely durable chrome that adds a streamline shiny look, easy to match stainless steel with a luminous metallic finish and cost effective aluminum that is rust-free. Aside from upbeat style, metal legs are great for upholstery that may be exposed to moisture on a daily basis. Furniture feet at Peter Ross Enterprises are designed in numerous creative shapes. Round furniture feet can also be considered bun feet. Round feet are very popular for matching upholstery such as sofas, chairs and a chaise lounges. Wooden bun feet also add a nice touch to trunks, dressers and cabinets. In addition, there are a wide array of shapes and round feet heights, making it easy to match style. In older designs, square legs were limited to a tapered look. Today, square legs come in many forms, heights and materials. You can choose metal or wood as well as tapered, rectangle or a simple block design. And when matching upholstery, there are no limitations to what you can do. At Peter Ross Enterprises, you will find a huge selection of square legs that set the standard of sophistication. When repairing and restoring upholstery, it is important to update the furniture legs of the piece. The new legs should support the item in both weight and in style. Moreover, furniture legs need to match your current décor plus be durable for long wear. Peter Ross Enterprises has a huge variety of furniture legs. But if you cannot find the style you desire, it can be custom made. As a matter of fact, Peter Ross Enterprises specializes in creating customized furniture and furniture legs. To match the ideal furniture legs for your upholstery, contact Peter Ross Enterprises today. © Copyright 2017. All rights reserved by | » Furniture Legs to Match Your Upholstery Repair and Restoration Peter Ross Enterprises Melbourne | Website Designed by: Netwizard Design.